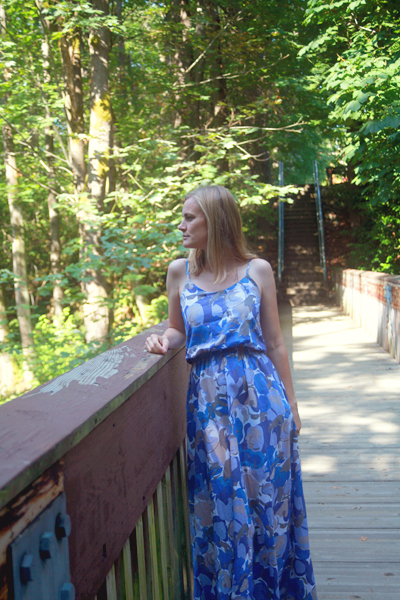 When it came time to choose the pattern, I went to one I’d made earlier this summer, the Sewaholic Saltspring dress. The pattern recommends using lightweight wovens, but none of the examples given are cotton voile. Even so, I forged ahead, trusting that this fabric would blouse and drape just as I wanted because of the loose fit and the clever design of the bodice lining. And, I have to admit, I’m quite pleased with the outcome. The fabric was a breeze to work with, which gave me the confidence to change up the pattern just a bit. My first change was to the straps. Instead of having two straps on each side that tie at the top of my shoulders, I cut each side as a single strap. First, I measured the length of the tied straps on my first Saltspring dress and added seam allowances (10 1/2″ + 5/8″ + 5/8″, if you’re curious). Then, after sewing the strap onto the front bodice, I carefully wrapped it around to the back and pinned it in place, making sure not to twist the strap in the process. The second big change I made was to eliminate the zipper in the back. 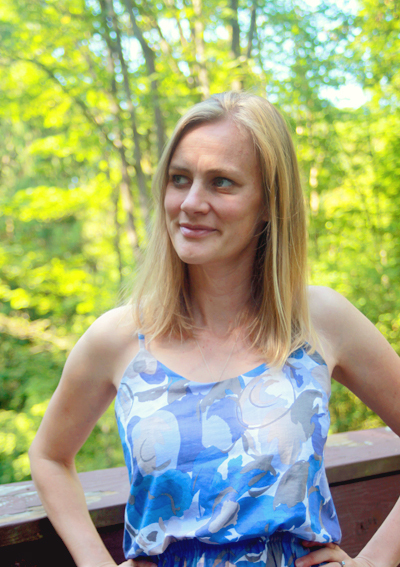 After figuring out I could easily put my first Saltspring dress on and just as easily take it off without messing with the zipper, I decided all future makes would be zipper-less. But, when I was cutting my fabric, it didn’t occur to me that going zipper-less meant I could also eliminate the back center seam. Thankfully, this print hides the unnecessary seam pretty well. Though it was made by total accident, that little white squiggle on the left strap (above) makes me really happy. I found that one of my favorite parts of making this dress was seeing what crazy abstract patterns appeared as I was turning the tubes to make the straps. It’s always the little things, right? One final change I made was to grade the pattern down to a zero below the waist since I don’t have the pear shape that Sewaholic patterns are designed for. I’m not sure I notice much of a difference though. The skirt if full and flowy either way! Hidden in the skirt is another favorite feature of mine: the side seam pockets. I really like having a place to put my hands and keys and such. Though I have begun to think about my fall sewing, I’m not ready to let go of summer sewing just yet. Thankfully the Seattle weather seems to be cooperating with me. Here’s to a few more weeks of strappy summer dresses! sooo well done. i’ve always wanted to sew a maxidress for myself. yours gives me inspiration. This dress is absolutely gorgeous!!!! Would you mind if I ordered that fabric? I won’t use the same pattern but I’d love to have a dress of that fabric! By all means, order this fabric! It was wonderful to work with, and I feel like I’m covered in painted flowers when I wear this dress. And, even if you decided to use the same pattern, I wouldn’t care. So, go order! I am in Seattle too! We will have to meet up with some handmade outfits sometime. I don’t know anyone who sews clothes here. Do you know of any groups who meet up etc.? I love what you did with the dress. I thought it was jersey it drapes so well. It’s just lovely, great work! I’ve started to meet a few people. In fact, we are getting together this morning for a fitting lesson. I’ll let you know when we are meeting up again next! I’m in Seattle, too! Hooray for Rain City sewers. This dress looks so lovely — easy to wear but still stylish. Really pretty fabric choice for a great dress. Inspired fabric choice for this pattern–it looks awesome! I love that you omitted the zipper, too! Thank you! I’m very happy with the dress, and not having to put in a zipper made this a quick make! Lovely! That fabric is perfect, great job! I also like to see what new patterns are created when you cut up a print fabric and then re-assemble it. Your dress is very pretty. Thanks. Yeah, enjoying seeing the patterns created by turning the tube made it a much less tedious step! you look lovely and so does your dress. Thank you for making this dress again! The fabric is magical. I’m starting the Saltspring sew-along on Monday and will be making a muslin since I’m a beginner. I’m a little hesitant to select fabric fearing it may be a challenge for a beginner. I’m happy to have cotton voile as a choice. I’m off to look at fabric selections again! A muslin is a good first choice for a beginner. You’ll get to see things you might want to change before cutting into nicer fabric. Good luck! I’ll be following the Sew-Along! Beautiful! This is the perfect fabric for the Saltspring. I just love the design of this pattern. Your backgrounds are so pretty too – I’m happy to see you’re finding some nice spots in Seattle! Yes, I’m starting to find se favorite spots around my new area already! This bridge is in a park I really enjoy. It’s fun to have serious woods in the middle of the city! Beautiful, Amy! And it looks like you can wear it for awhile throughout the pregnancy, if the weather cooperates! That’s my plan! I like it under cardigans and little jackets, so I hope it’ll last for at least most of September… I don’t really have any concept yet as to what will happen when! I love this dress! I agree about the sqiggle print on the strap…that would make me happy too! I may have to order this pattern, Thanks for sharing that you didn’t need the zipper. I think I would make the same adjustment! It’s definitely worth it to remove the zipper if you can get the dress on and off without it. Perhaps baste up the back first to see? You’ll end up with a seam down the back like I have, but you’ll at least have a chance to still add the zipper if you need. 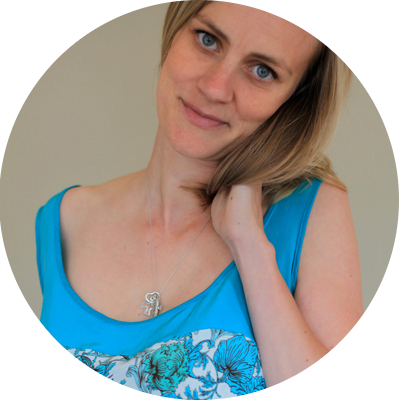 Amy, you look lovely in your new maxi-dress; thanks for showing it to us! 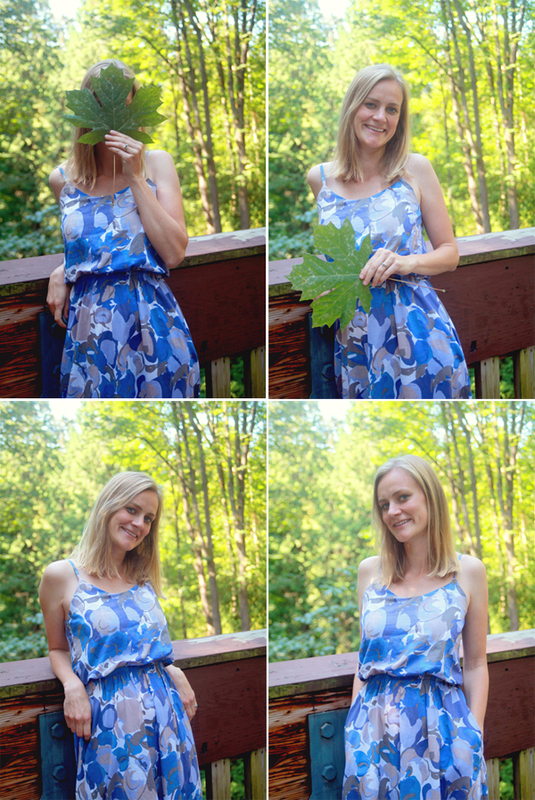 All the elements to love….voile, maxi, no zipper and maternity wear! Really great. Thanks! It really is a great summer dress. I couldn’t be happier! Amy this is Gorgeous!! My gosh, I think I might like this version even more than your first one (and I was in LOVE with that one so that’s saying a lot.) I love the new straps and also good to know you were able to get by without a zipper. Any project not needing a zipper makes me one happy girl. I’m seriously considering making this now, I just love yours so much. Yes of course I’m not jumping onto the maxi dress bandwagon in August when Summer is almost over. ha oh well. Do it! You’d look so cute in a maxi! I love the fabric with this pattern. Thanks. It came together well. 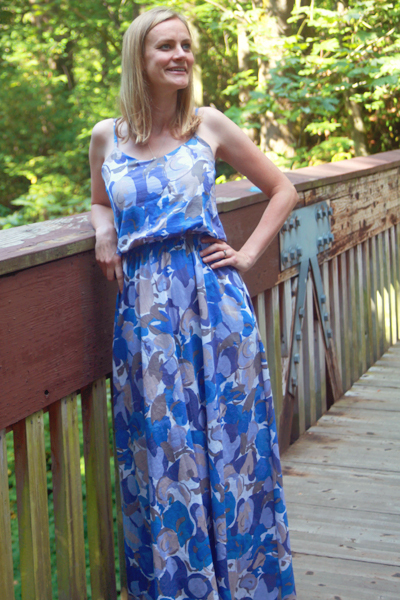 I’ve now made two Saltspring dresses in lightweight cottons, and they’ve both worked out! Very pretty. I like the changes you made to the pattern – subtle, but effective. I hope you have a special occasion coming up to which you can wear this lovely, eye-catching dress! Thanks. They were small changes, but I think they worked well here. I plan to wear this dress as much as I can before the weather turns! I love this dress! And thank you for posting about eliminating the zip – I had been wondering and now I know! You look lovely. I can get in and out of the dress just fine without the zipper. My elastic stretches far enough that I can pull it right over my shoulders. Hopefully the same trick will work for others! This is a fabric and pattern match made in heaven! So summery! Thank you. It feels quite summery indeed! Oh I love it! Summer sticks around for a long time here, so that would justify me needing this patter…right?!? Definitely! Get the pattern! And the fabric! At least get the pattern. It’ll carry over into fall decently well with a cute jacket or cardigan, too. I love reading your blog and this dress looks darling on you. I live here in Seattle and hasn’t this summer been beautiful? I bet you will have many more opportunities this summer to wear it! Does your sewing group meet at a sewing store? Hi Leslie! We’ve been meeting at people’s houses because we’ve been doing a lot of walking around in half pinned muslins, so privacy is important! In the future when we want to get together for other activities, I hope to look into sewing stores and other locations that will keep things interesting. Ideas or suggestions? Bernina NW (Northgate area) may be a place to gather as I know they have a room where they have classes. A fabric store would be fun, but not sure whether they would have a separate room for a class. This dress pattern is so cute and I love your version of it! Pretty cool that you don’t need a back zipper, why bother if its not necessary? And, I know what you mean about abstract fabric. I made a skirt a bit back with this really large abstract floral print and the skirt had inverted box pleats so it made the fabric totally change. It was fun to see the outcome! Just beautiful, love all the pics. Blue is a good color for you. Saltspring is such a pretty pattern, love your version. This is a beautiful version (as is your Liberty dress) and the maxi length really suits you. 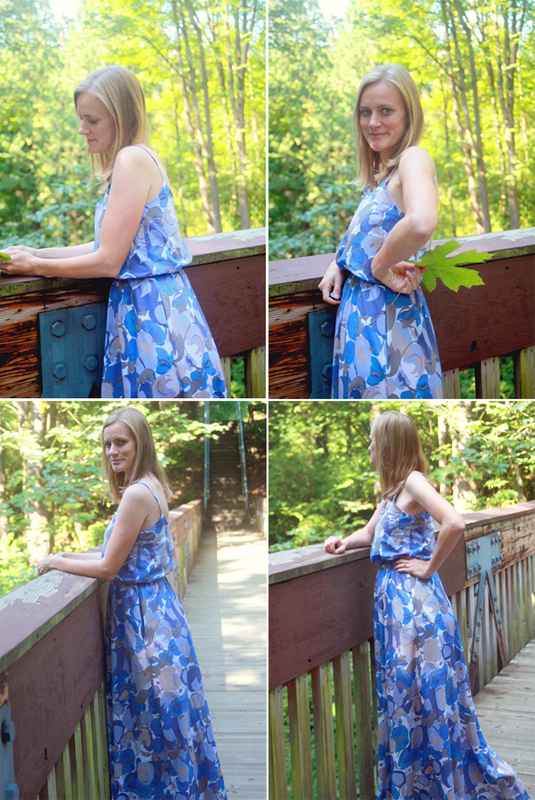 I pattern tested the Saltspring too and sewed both versions – one in chiffon & one in Liberty jersey, but I was afraid to sew it in a voile after a desperately unflattering effort at a Japanese top in voile. I’m so delighted to see how wonderfully the pattern works in cotton voile-I might even consider a third version. i love it! so dreamy… great print choice! That is just the perfect fabric & print for this pattern! I tested the short version too (without a zip), and had the same afterthought about the back seams- oops! I really want to make a maxi version of this one because of the nice shape of the skirt – it’s not just gathered rectangles as so many are these days. Really pretty fabric – and nice pattern! You did a lovely job sewing this dress. I can’t see any center back seam either. ;o) I’m not done with my summer sewing either. Sept. is usually warm in the Bay Area so I’m still going to sew the cotton voile I’ve get on hand. Whoa – this dress is beautiful! And the colour looks amazing on you! this really is perfection in a summer dress. Three! I think I’d like to make a Saltspring top like Caroline posted the other day sometime. I think it would be a good layering piece for fall. Such a beautiful dress, Amy. And the photos are so lovely too. I feel like I missed out on making a maxi for the summer. Seriously onto Autumnal stuff now… brrrr!